Isabel Leonard and Paul Appleby in Pélleas et Mélisande. Claude Debussy only wrote one opera. Pélleas et Mélisande (based on a symbolist play by Maurice Maeterlinck) succeeds by destroying many of the conventions of the genre to which it belongs. On Tuesday night, the Met unveiled its revival of Pélleas, another acid test for its new music director Yannick Nézet-Séguin and a younger generation of singers wandering through the hazy, maze-y woods of the mythical kingdom of Allemonde. Here, those woods are represented in a production by Jonathan Miller: a series of big chilly rooms in a manor house, using the Met turntable to cope with the shifting settings and moods. From the first pianissimo bars Nézet-Séguin took command of this challenging score. His approach is to use a lot of rubato, stretching out the fabric of this music to a thin tissue before surging ahead with faster tempos when warranted. He conducted these five acts as a series of symphonic poems, drawing volume from his players when needed but never overshadowing the voices with gloom. The final pages depicting Mélisande's death simply seemed to melt away, with a hushed, awed audience actually holding their applause until the last curtain came down. Mélisande, who is first seen weeping in a dark forest is an enigmatic heroine. She may have escaped a terrible situation (the character shares her name with one of Bluebeard's wives) only to arrive in a worse one: a loveless marriage to the intemperate Prince Golaud. Her daily escape is her playful love affair with his younger brother Pélleas: her immediate soul mate and the cause of the lovers' ultimate destruction at the hands of Golaud. This music is challenging for the singers as it confines them to parlando dialogue over the surges and swells of the orchestra. Isabel Leonard used her fine-etched voice to make the most of moments like the beginning of Act III, where her siren song tempts Pélleas, and the Act IV scene where the lovers meet, finally kissed, and Pélleas dies. 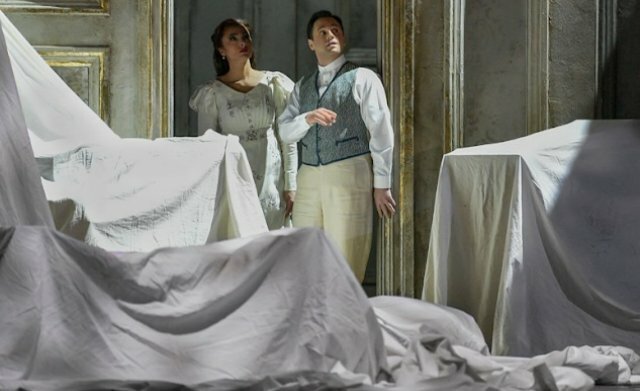 Her final fadeout is one of the most passive deaths in all of opera, and while Leonard did not have many dramatic notes to sing in the last act, she remained a sympathetic, if largely immobile presence. Paul Appleby is on a road to stardom, but Pélleas was a mis-step for this lyric tenor. He maintains a sweet and pleasant temper and his genial onstage disposition is well suited to the role. However, at three separate points in the evening he showed real difficulty with the role. notes that should have been flowing and lyric came across as effortful and over-pressured. This was most noticeable in that last duet as he reached for a note and brought down only a gargled yelp: a troubling sign for this fine young artist. At first, one questioned the casting of the young and handsome Kyle Ketelsen as the oldish and cantankerous Golaud. However, Ketelsen showed considerable dramatic ability, playing the character to a slow, rolling and ultimately scalding boil. He lost his mind slowly as the opera progressed, with suggestions of violence emerging and then bursting to the surface to the terror of the other characters. The big scene in Act IV where he attacks Mélisande in front of King Arkel was chilling: a terrifying study in domestic abuse. The other treasure here was the veteran bass Ferruccio Furlanetto, who made the elderly, blind King Arkel a much more forceful character in the final act. At the other end of the spectrum stood the young A. Jesse Schopflocher as Golaud's little son Yniold. It is that boy's piping protest at his father's sudden turn to violence that indicates what the source of Pélleas and Mélisande's downfall will be. It is also the most disturbing scene in the opera: lovingly conducted and masterful in its orchestration and execution.